As we wrote about in our recent eGuide, the first major revision of the Global Investment Performance Standards (GIPS®) in more than a decade is underway. Known as GIPS® 2020, the project aims to bring the standards closer to universal acceptance by asset managers, asset owners and regulators, by filling the gaps that currently exist, eliminating the unnecessary elements and correcting misinterpretations where they previously existed. 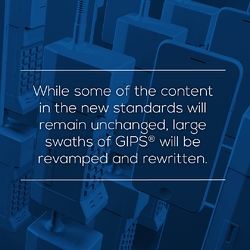 Whilst some of the content in the new standards will remain unchanged, large swaths of GIPS® will be revamped and rewritten. The public comment period is still upon us (ending December 31, 2018) to garner feedback on the draft version of GIPS® 2020. With that in mind, let’s take a look at some of the most notable proposed changes so far. The current GIPS® structure focuses solely on firms, despite both firms and asset owners claiming compliance. The GIPS® 2020 proposed draft addresses this issue with a new structure that includes sections for both firms and asset owners, enabling those claiming compliance to refer directly to their relevant sections and eliminating the need to review non-applicable provisions. In the draft of the new standards, the asset class distinction has been removed to allow firms more flexibility for presenting money-weighted returns (IRR has been renamed to money-weighted-returns, or MWR). Under the new proposed standards, a firm may choose to present MWRs instead of TWRs when certain criteria are met for a specific composite or pooled fund. The GIPS® standards created in 2010 required that carve-outs be managed with their own cash balance. The proposed new standards reverse that, instead allowing firms to designate cash for carve-outs. The change was made “after much debate,” the CFA notes, adding that if firms choose to allocate cash to a carve-out, they must do so for all carve-outs managed in that strategy. This could have the effect of making GIPS® compliance more palatable for private equity and real estate fund managers, who had expressed concern that the inability to create returns that include assets drawn from multiple portfolios or funds does not meet their reporting needs. Notably, one aspect of GIPS® that is proposed to stay the same in GIPS® 2020 is the statute that an asset owner is able to compete for business by marketing to prospective clients, provided that the part of the asset owner that is competing registers as a separate firm. This separate firm will continue to be required to comply with those aspects of GIPS® that are related to firms and all other applicable requirements. There are, of course, more proposals in the GIPS® 2020 draft worth taking note of, and part 2 of this blog will examine more of these in detail.